Arsenal remain within touching distance of the Premier League's top four after victory over QPR - but only after being reduced to 10 men and conceding a second-half penalty. Alexis Sanchez missed a spot kick but later headed Arsenal into the lead. Tomas Rosicky doubled their advantage after Olivier Giroud was sent off for a headbutt on Nedum Onuoha. Then, in a nervy climax, Mathieu Debuchy felled Junior Hoilett and QPR's Charlie Austin converted from the spot. That was his 12th league goal of the season and set up a dramatic final 10 minutes, but QPR were unable to breach Arsenal's defence for a second time. A team which has yet to win a point away from home was just the sort of opponent Arsene Wenger's side needed after a period in which the manager has come under heavy criticism. But the Frenchman will not thank his compatriot Giroud for his senseless reaction to a Onuoha push, which forced the hosts to play the majority of the second half with 10 men, nor Debuchy for the penalty he conceded, adding needless drama to what should have been a routine win. Alexis Sanchez (10 goals, six assists) has scored or assisted half of Arsenal's 32 Premier League goals this season. Ian Wright (14) is the only player to reach 10 Premier League goals in fewer games for Arsenal than Sanchez (17). Only Cesc Fabregas (12) and Gylfi Sigurdsson (8) have more league assists than Alexis Sanchez's six this season. Alexis Sanchez now has 15 goals in all competitions for Arsenal this season, level with Tottenham's Harry Kane. The Gunners have nine points fewer than at the same stage last season, when they were level with league leaders Liverpool. Indeed, a Boxing Day victory was a must if title hopes were not to be completely extinguished before the end of the year. Even after victory, which was Wenger's 400th in the league, Arsenal remain 15 points behind leaders Chelsea and two points adrift of fourth-place Southampton, with every team in the top four also enjoying wins. This was an improvement of sorts on last week's display against Liverpool, but Arsenal are unlikely to come up against a team as obliging as QPR were in the first half. Harry Redknapp men's somehow soaked up wave after wave of attacks until, eventually, they caved in seven minutes before the break. A lovely move, featuring Danny Welbeck, Santi Cazorla and Kieran Gibbs, was finished off by Sanchez to give his team a deserved lead. That made up for the Chilean's miss from the penalty spot after he was challenged clumsily by Armand Traore, with the diving Robert Green saving Sanchez's tame effort. A hint of the defensive frailties which have plagued the Gunners this season was given when Steven Caulker sneaked behind the defence and headed a fraction wide. But although Giroud gifted the QPR a lifeline, the visitors were unable to test the Arsenal back four before Rosicky scored. Sanchez was the creator, elegantly weaving his way towards the box before releasing the equally impressive Czech, who swept home on his first league start of the term. Until Debuchy was penalised for bringing down Hoilett - though replays showed the defender did make contact with the ball - QPR were unable to test Arsenal. And although Austin, quiet for much of the match, scored to set up a grandstand finish, Arsenal held firm to inflict a ninth away loss on QPR. Match ends, Arsenal 2, Queens Park Rangers 1. Second Half ends, Arsenal 2, Queens Park Rangers 1. Attempt missed. Niko Kranjcar (Queens Park Rangers) right footed shot from outside the box is high and wide to the left from a direct free kick. Francis Coquelin (Arsenal) is shown the yellow card for a bad foul. Niko Kranjcar (Queens Park Rangers) is shown the yellow card for a bad foul. Attempt blocked. Eduardo Vargas (Queens Park Rangers) right footed shot from the centre of the box is blocked. Attempt blocked. Eduardo Vargas (Queens Park Rangers) header from the centre of the box is blocked. Assisted by Niko Kranjcar with a cross. Corner, Queens Park Rangers. Conceded by Mathieu Flamini. Substitution, Arsenal. Francis Coquelin replaces Danny Welbeck. Attempt missed. Niko Kranjcar (Queens Park Rangers) left footed shot from outside the box is too high. Assisted by Junior Hoilett. Substitution, Arsenal. Calum Chambers replaces Tomas Rosicky. Goal! 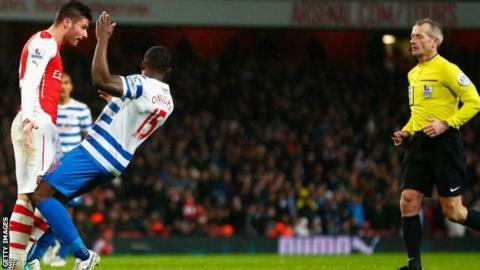 Arsenal 2, Queens Park Rangers 1. Charlie Austin (Queens Park Rangers) converts the penalty with a right footed shot to the centre of the goal. Penalty Queens Park Rangers. Junior Hoilett draws a foul in the penalty area. Corner, Arsenal. Conceded by Junior Hoilett. Attempt blocked. Mathieu Debuchy (Arsenal) right footed shot from the right side of the box is blocked. Assisted by Alexis Sánchez. Attempt blocked. Bobby Zamora (Queens Park Rangers) left footed shot from the centre of the box is blocked. Assisted by Charlie Austin. Attempt missed. Niko Kranjcar (Queens Park Rangers) right footed shot from outside the box misses to the right. Attempt saved. Danny Welbeck (Arsenal) right footed shot from the centre of the box is saved in the top right corner. Assisted by Alexis Sánchez. Attempt missed. Alexis Sánchez (Arsenal) right footed shot from the centre of the box is close, but misses the top right corner. Assisted by Mathieu Debuchy. Substitution, Queens Park Rangers. Bobby Zamora replaces Jordon Mutch. Attempt missed. Santiago Cazorla (Arsenal) left footed shot from outside the box is just a bit too high from a direct free kick. Junior Hoilett (Queens Park Rangers) is shown the yellow card for a bad foul. Mathieu Debuchy (Arsenal) wins a free kick in the attacking half. Attempt saved. Mauricio Isla (Queens Park Rangers) left footed shot from the right side of the box is saved in the bottom left corner. Attempt missed. Niko Kranjcar (Queens Park Rangers) right footed shot from outside the box misses to the left. Attempt blocked. Charlie Austin (Queens Park Rangers) right footed shot from the left side of the box is blocked. Assisted by Steven Caulker. Goal! Arsenal 2, Queens Park Rangers 0. Tomas Rosicky (Arsenal) right footed shot from the centre of the box to the centre of the goal. Assisted by Alexis Sánchez following a fast break. Attempt missed. Junior Hoilett (Queens Park Rangers) right footed shot from outside the box is high and wide to the right. Assisted by Niko Kranjcar. Substitution, Queens Park Rangers. Leroy Fer replaces Karl Henry. Substitution, Queens Park Rangers. Junior Hoilett replaces Armand Traore. Attempt missed. Alexis Sánchez (Arsenal) right footed shot from the left side of the box misses to the right. Assisted by Santiago Cazorla.